Bitcoin can be interpreted as a cryptocurrency, an asset class, a payment system, and a store of value. In reality, it is not a shiny coin with a Thai baht symbol on it. It is software, a digital phenomenon, a set of processes and protocols. 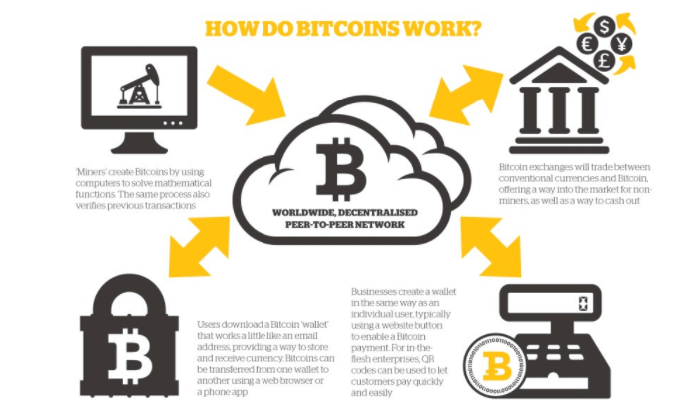 Bitcoin is virtual money produced using cryptography. It was established by an unknown man or several people under the name of Satoshi Nakamoto. Cryptocurrency was released as open-source software in 2009. Despite being virtual, it can be exchanged into other currencies, products, or services. At present, millions of unique users in the world use a cryptocurrency wallet. All transactions are recorded in a public distributed ledger that is called a blockchain. Blockchain is a name of the protocol designated for bitcoin network. Satoshi Nakamoto’s paper mentioned about blockchain and bitcoin in 2008. The two terms were perceived as synonymous in the beginning. After a while, blockchain was separated from bitcoin, and thousands of blockchains appeared using cryptographic techniques. Thus, blockchain can be referred to not only bitcoin blockchain, but blockchain technology in general. certificates – that is a string of 0s and 1s. Concerning bitcoin, the information is transactions in most cases. In short, one person sends X bitcoin to the second person who sends Y bitcoin to the third person, etc. Blockchain is public, and it can be downloaded in its entirety on any quantity of websites. It means that the network is not fully anonymous, though adopting precautionary measures will provide significant obstacles to link transactions to individuals. Bitcoin is not physically present. Thus, it cannot be hidden in a safe to be protected. It would be enough for a thief to add “You paid me everything you have” into the ledge (another name for blockchain) to steal it from you. You would need trust to prevent it. That trust could be a central bank or single administrator. But you don’t need any trust with bitcoin as the network is fully decentralized. It means that everything is working as designed. All transactions take place between the users without any intermediary. Cryptographic protocols guarantee that all blocks of transactions are joined together in a long chain. Bitcoin is created as a prize for mining. Mining is a process that maintains blockchain. A network of miners records strings of transactions on blockchain and forms a basis of users’ network. The network appeared when Satoshi mined the first block on chain known as genesis block in January 2009. Bitcoin software makes the process of mining difficult and time-consuming. The difficulty is necessary to prevent from spoofing a transaction. In other words, it would be easy for a thief to insert fraudulent transactions into past blocks with the same token, for example. Virtual money would become worthless. A complicated process of mining limits the network to one new, 1-megabyte block of transactions every 10 minutes. It enables the network to have time to vet ledger and new block and ensures the users to reach a consensus about status quo. The longest chain is the most valid as the most work has gone into it. The network of miners receives the latest transaction data. Miners run the data with use of a cryptographic algorithm which generates a “hash,” a string of numbers and letters served to verify the validity of information without its revealing. Mining is intensive and competitive. It requires big and expensive rigs and a lot of electricity to power them. Target is to plow through them as quickly as it is possible. As soon as a new block is mined, a successful miner receives a newly created coin. Some worries that miners have begun to form pools. If a pool exceeded 50% of mining power, its participants would be able to spend coins, reverse transactions, and block other transactions. It could lead to an end of bitcoin. But proof of work requirement makes it pointless. Concerning bitcoin ownership, it is limited by two numbers that are a public key and a private key. A public key is a username while a private one is a password. A hash of public key, named an address, appears on blockchain. The sender needs your address and identity verification to send cryptocurrency to you. If you want to access cryptocurrency, you need a wallet. It keeps necessary information to transfer coins. Wallet is a set of cryptographic keys that can be third-party web apps offering insurance and debit cards or QR codes. There are “hot” wallets and “cold” wallets. “Hot” wallets are connected to internet and vulnerable to hacking. “Cold” wallets are not connected to net. Software wallets fall into two categories, such as full clients and lightweight clients. Full clients are the most secure to use the network. They verify the transactions directly on a local copy of blockchain. With a lightweight wallet, the users can send and get transactions without requiring a copy of the entire blockchain. Bitcoin is not tied to real entities but addresses. Although you can see the transactions on blockchain, you cannot identify the owners of addresses. Moreover, the transactions can be connected to individuals and companies using “idioms of use”. To enhance the privacy, each transaction can require a new address. Bitcoin exchanges can prove assets, liabilities, and solvency without disclosing their addresses with use of zero-knowledge proofs. The price of bitcoin has undergone different cycles of appreciation and depreciation. Its value increased from about $0.30 to $32 in 2011. During the Cypriot financial crisis, its price reached $266 in April 2013, but then it fell to $50. Its cost rose to $1,242 on November 29, 2013. After that, it fell sharply to $600 in August 2014. According to Mark T. Williams, bitcoin has the volatility that is seven times greater than gold, eight times larger than the S&P 500, and 18 times bigger than the US dollar. On April 19, 2016, Wall Street Journal suggested that its value might be more stable in the future. Its price surpassed market value of an ounce of gold of $1,268 on March 3, 2017. Due to a decentralized nature of bitcoin, the states cannot alter technical rules of the network or shut down it. Usage of the virtual money can be criminalized, and the closure of exchanges and a decentralized model of the economy in a particular country would constitute a “de facto ban”. The legal status of bitcoin differs in various countries. Some countries don’t prohibit its use and trade, others ban or restrict it.